Chettinad is a region of the Sivagangai district of southern Tamil Nadu state, India. Karaikudi is known as the capital of Chettinad, which includes Karaikudi and 74 other villages. Chettinad is the homeland of thrtie Nattukottai Chettiars (Nagarathar), a plarly Ceylon and Burma, in the 19th and enad speak Tamil. Today there is a diaspora of Chettinad people, who live in the USA, Singapore, Malaysia, among other places. Chettinad- The Land of Herit e & Devotion It is a place that enchants and enhances the soul. Chettinad is the homeland of the Nattukottai Chettiars called the Nagarathars, are a prosperous banking and business community. is a tourist's paradise with a difference, and one whi certainly cannot be missed by the discerning tourist. A stray thundershower adds to the charm of the place, churning up the red soil, and filling up the temple tanks. The palatial mansions, m es Chettinad a place of rare charm, and a must visit destination. 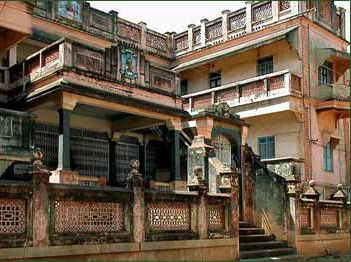 imgChettinad Houses Chettinad, rich in cultural heritage, art and architecture, is well known for its ses, that are embellished with marble and Burma teak. The houses have wide inner courtyards and spacious rooms. The grandly and wonderfully embellished houses were created reflect the prosperi of the Nagarathar community. The basic design comprises of a "thinnai" which is an enclosed courtyard and this is surrounded by family rooms. The wa are smooth and are made of special pla er. The plaster involves the application of the finely ground mixture of powdered shell, lime, jaggery and spices, including gallnut (myrobala to walls. This technique kee s the interior of the house cool during the hot and humid Indian summers and lasts a lifetime. The architectural structure of a typical Chett ith nature. High ceilings, airy and well ventilated, the house has one courtyard near the entrance leads to the imposing main door, usually made of wood with extraordinarily intricate carvin s of mythological figures. The thinnai is a long n rrow raised platform that serves as a meeting place and also as a kind of accomodation for travellers and visitors. The inner courtyard has special significance. It is ed with classically bea tiful pillars ma e out f granite or teakwood. The courtyard serves as the venue for the many ceremonies that the community performs from births to weddings o death. Deliciously Chettinad Among t arious South Indian food varieties, the Chettinad style holds a special place for food lovers. Chettinad' m usual and familiar food items they have a list of peculiar snacks items that are delicious a d colourful enough to be a temptation to eat. So of the food items that are made by Nagarathars are the following: Ukkarai, Kandarappam, Karupatti Pani aram, Kavanarisi, Pal Paniyaram, Thenkuzhal and Seepu seedai and many more.